Trying to eat better this year? I know, it’s extra-hard when it’s freezing cold outside and delivery pizza is just one call away. This warm, fresh yet hearty salad is the perfect solution. It packs well for lunch, too. 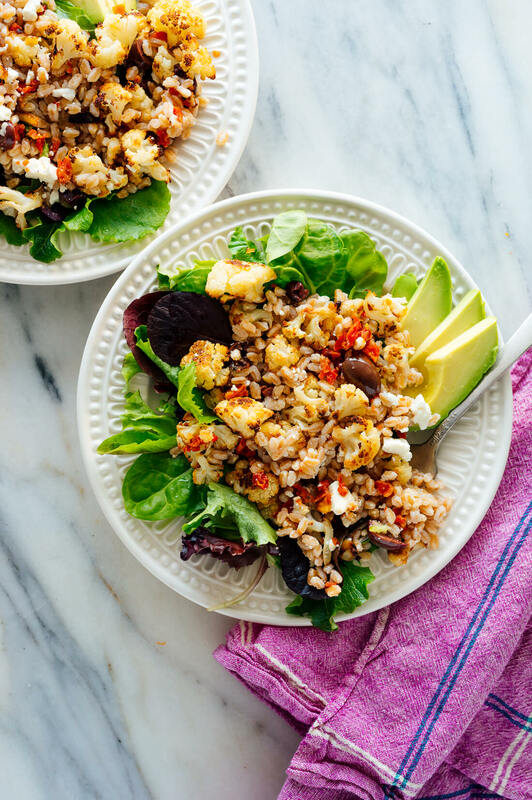 I really love the combination of garlicky farro with roasted cauliflower and salty feta and olives. Farro is an ancient grain related to wheat that you should be able to find in the health section of grocery stores. It’s nutty in flavor, freezes and defrosts well, and offers some heft to salads. Fresh greens, sliced avocado, and lemon round it out. This seasonless salad is bursting with bold Mediterranean flavors. You might recognize this salad from the archives. We have a lot of new visitors this year (hello and welcome! ), and I’m trying to make sure my favorite recipes have appealing photos. I love revisiting existing recipes because they give me more creative energy to devote to new recipes. I’m working on a new batch this week and can’t wait to share the results with you. 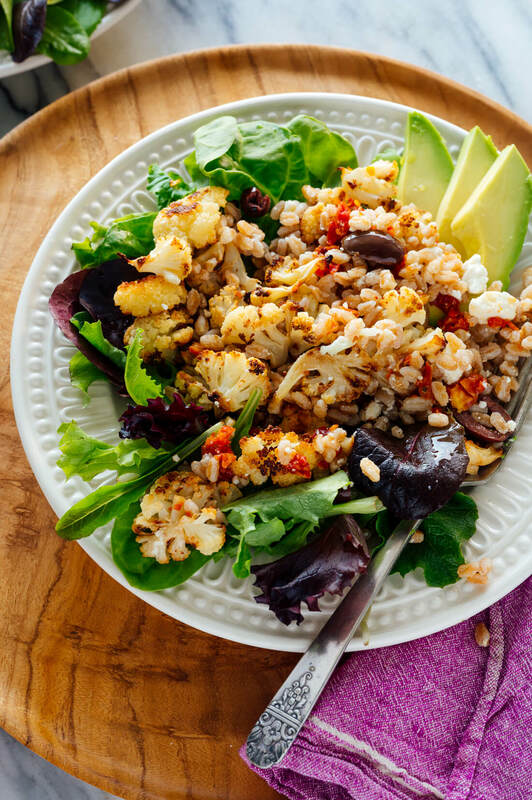 This recipe was inspired by a roasted cauliflower and farro salad I found in La Jolla, California. Four summers ago, I happened to be in San Diego at the same time as my parents. My friend and I met up with them for lunch at George’s, an unassuming restaurant with a faded, burgundy awning over the entrance. My friend and I were feeling a little rough after a late night out, but that cauliflower salad brought me back to life. 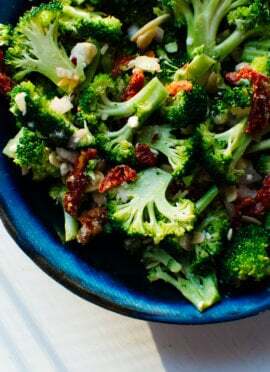 When I recreated it at home, I added some sun-dried tomatoes and greens to my version and loved how it turned out. I love this salad exactly as written, but it’s a flexible recipe. For extra protein, stir some cooked chickpeas or lentils into the farro, or top your salad with a fried egg. You could also add a handful of chopped leafy fresh herbs, like parsley, basil or dill. Other options include chopped red onions or freshly toasted pine nuts or sunflower seeds. 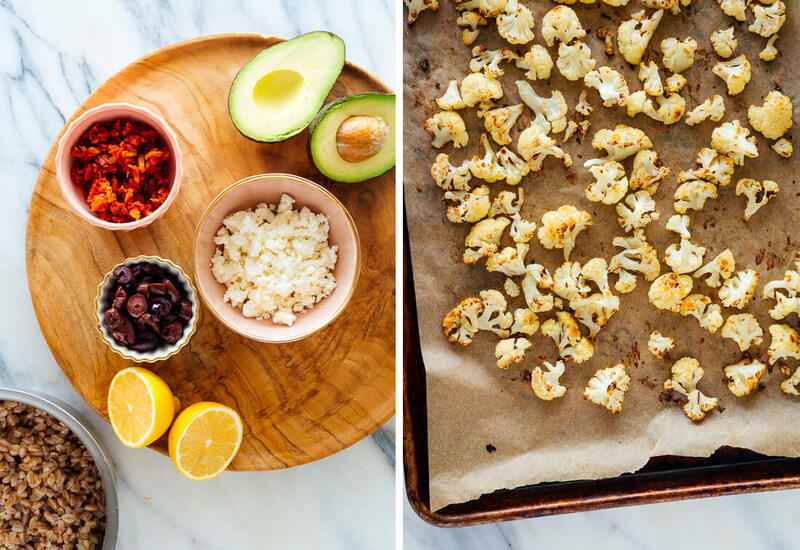 You could roast broccoli instead of cauliflower. Skip the olives if you’re not into them. See the recipe notes for suggestions on how to make this salad gluten free, and/or vegan/dairy free. Please let me know how you like this salad in the comments. Your feedback keeps me going. Craving more hearty, bold salads like this one? 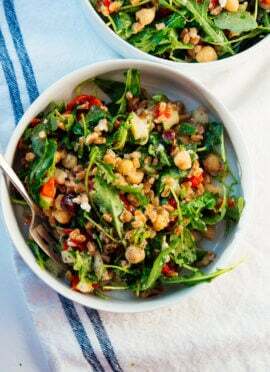 Don’t miss my Greek kale salad, Jessica’s Marinated Chickpeas, Greek Lentil Salad and Arugula and Wild Rice Salad. This salad is a meal in itself, but you could round it out with a warm cup of lentil soup, butternut squash soup or creamy cauliflower soup. 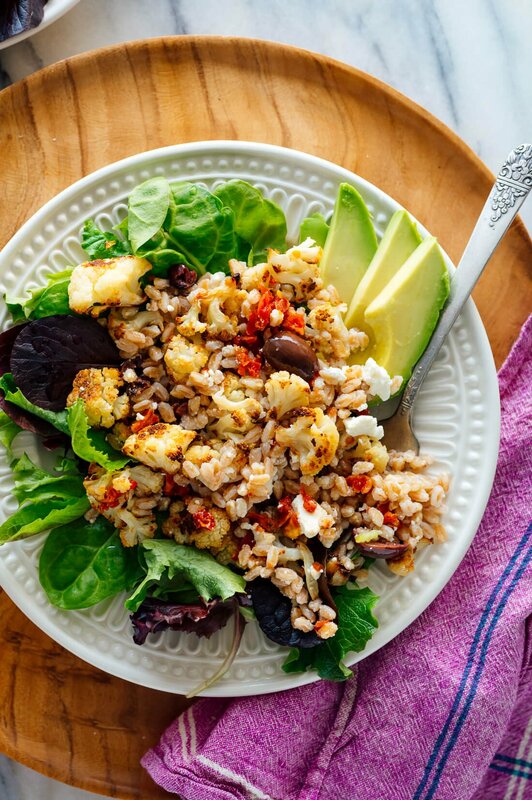 This satisfying vegetarian salad recipe features warm whole grains, roasted cauliflower, fresh greens and bold Mediterranean flavors. It packs well for lunch, too! 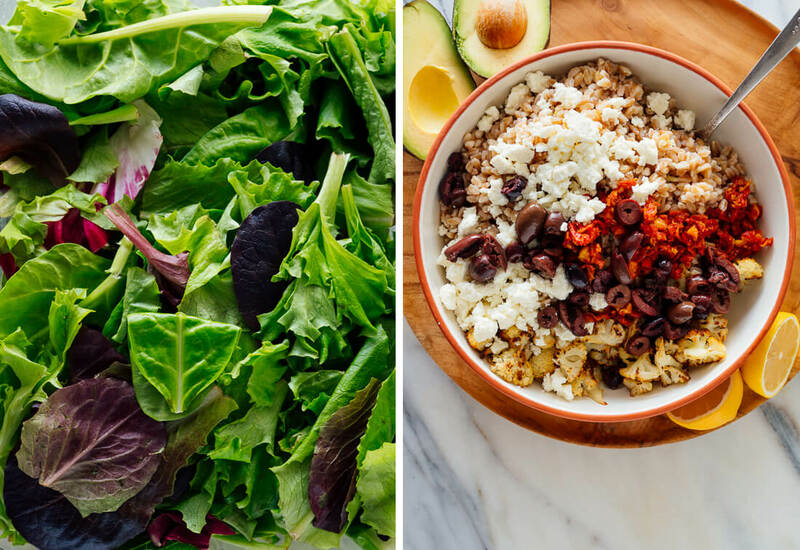 Recipe yields 4 hearty salads. To roast the cauliflower: Preheat the oven to 425 degrees Fahrenheit. Toss the cauliflower florets with the olive oil, red pepper flakes and salt, and arrange it in an even layer across the pan. Roast for 25 to 35 minutes, tossing halfway, until the cauliflower is tender and deeply golden on the edges. To cook the farro: In a medium saucepan, combine the rinsed farro with at least three cups water (enough water to cover the farro by a couple of inches). Bring the water to a boil, then reduce the heat to a gentle simmer, and cook until the farro is tender to the bite but still pleasantly chewy. (Pearled farro will take around 15 minutes; unprocessed farro will take 25 to 40 minutes.) Drain off the excess water and mix in the olive oil, garlic and salt. Set aside. 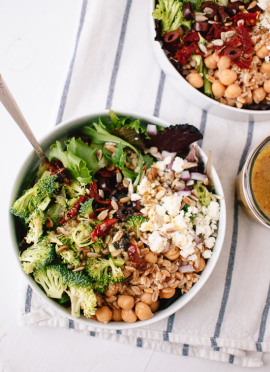 In a large serving bowl, toss together the roasted cauliflower, cooked farro, olives, sun-dried tomatoes, feta and lemon juice. Taste and season with additional salt and pepper if necessary. Divide the avocado and greens between four dinner plates. Top with a generous amount of the cauliflower and farro salad. Finish the plates with an extra squeeze of lemon juice or drizzle of olive oil, if desired. Serve promptly. Recipe inspired by George’s at the Cove in La Jolla. Storage suggestions: Leftovers should keep well for several days. Store greens separately and slice the avocado just before serving. Change it up: If you can’t find farro, spelt berries or wheat berries would be great substitutions. 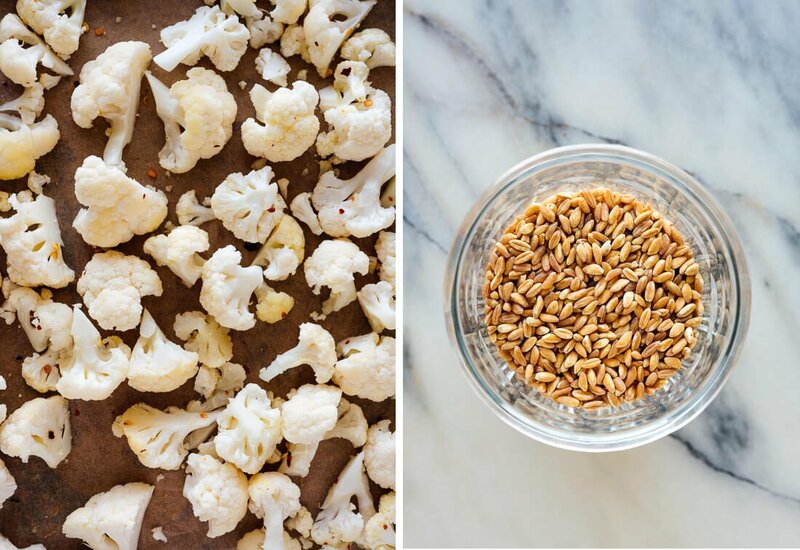 You might have to cook those grains longer. Make it gluten free: I think this would be good with cooked short-grain brown rice or quinoa instead of farro. Make it vegan: Skip the feta. You might want to add some extra olives to make up for it. OMG!! I made this salad last night and I do not believe there is a recipe from my vast collection that I enjoyed more. I had never even heard of farro before, but there it was, on the shelf at my favourite grocery store! The soft chewiness of the garlic flavoured farro with the roasted cauliflower, sun dried tomatoes and kalamata olives was divine. The feta and buttery avocado was the perfect finish to a stunning recipe. I can’t t wait to make it for my friends! I’m so glad you made it and loved it, Linda! Thanks so much for your review. Delicious!! I made a few changes: I omitted the feta. My salad base included red bell peppers, cucumbers and red cabbage. Not wanting to have raw garlic breath, I added the garlic as the farro was cooking. I added chopped raw almonds on top and a little homemade balsamic vinaigrette. Yummy! Thanks for this wonderfully inventive salad! Made this for dinner tonight….it was amazing! Added some chopped onion and a mix of pepitas & sunflower kernels that I toasted. I chose a combo of arugula and fresh spinach for my greens. Will make this one often! Great, Gail! Thanks for your feedback and review. Both my husband and 24 year old son were leery when they came to the dinner table but said it was way better than they expected and would be happy to have it again. SCORE! Thanks for your wonderful recipes!!!! I would say that’s a win! Thanks or sharing, Johanne! Off the charts for deliciousness and uniqueness! I get so bored with salads, but this is a keeper! Only change: I had no olives, so I used about 1/4 cup of Trader Joe’s olive tapenade. Perfecto. My daughter shared this recipe with me. Delicious! Such a nice combination of flavors! Comes together quickly too. Nice complete meal for a weeknight. I agree! Great meal for the weeknight, Faith. Thanks for your review! Oh, man, this was SERIOUSLY delicious. I will absolutely make this again. The flavors and textures were amazing, and even though it’s winter, this was a great way to get in a salad. It tasted cozy and yet sophisticated, somehow! Thanks so much! You’re welcome, Meredith! Thanks for your comment. I love your definition of salad! Seriously, all your recipes have been amazing, and I really just wish I could thank you. I feel that you have given me a personal gift by sharing all of this knowledge. I am having fun and helping my whole household eat delicious, healthy meals. THANK YOU! Thanks, Julie! I’m happy you love this salad. Love this recipe, it has become a favourite and I have made it several times now! Wonderful salad! I made it with half broccoli and half cauliflower. Didn’t manage to find decent avocados, but didn’t miss them. Used red wine vinegar instead of lemon. Will definitely make this again and again in multiple variations! This was delicious! I am so glad I discovered your blog – I make your recipes all the time and my family loves them. I have recently discovered farro and it is now one of my favorite grains. The only change I made was to throw the whole garlic cloves in with the farro while it cooked. Then I mashed them up and added them to the final dish. I don’t love raw garlic and usually do a quick roast in a skillet before using it. Cooking it in the boiling water was an easy solution. I’ve made this a few times and it’s delicious. I recommend adding parsley – it complements the flavors perfectly. Thanks! Hi Kate this looks so delish! I’m making it tonight. I’ve always loved my veges, I’m very interested in purchasing your cookbook, I’ll be in whole foods today and I’ll be sure to keep an eye out for it! Thank you, Melissa! Let me know what you think when you try it. Great to hear, GM! Thanks for your review. Hi! I love this recipe! I will make this again and again. I’m not a fan of olives or feta, so I substituted figs and goat cheese, respectively. The goat cheese with the guac makes it creamy and delicious. I also added toasted pine nuts. Crazy yummy! Thank you! Great way to make this more your taste, Susie! Thank you for your review.